‘Breathe’ is a range of highly effective meditation audios that assist in the control, release and management of anxiety. Designed by Benjamin Bonetti, International Best-Selling Author of “How To Stress Less”, this range of anxiety audiobooks utilise a number of his specialist cognitive tools to rationalise triggers, forgive the past and set a new vision for the future. Divided into two audiobook’s; An Introduction In To Anxiety (36 Minutes) and The Specialised Anxiety Meditation (23 Minutes) listeners can use as a part of the series or as a standalone audio. • BEST ON THE MARKET - The meditation this comes with is AMAZING. I cannot believe it – how effective it is. Not one time could I hear the entire session I was out like a light within minutes? I have used this every night with the same result. I love the voice on this, very calm and relaxing. HIGHLY RECOMMENDED. • VERY RELAXING - this is a great if you are new to meditation. Gets me into a deep meditative state and calms me down after a stressful day. • REALLY AMAZING - soothing accent!!!!! If you believe in having a stress free life this is a MUST HAVE. The music resonates long after the session is over. OUTSTANDING!! • A greater understanding of anxiety, the varying levels and what can be done to reduce and avoid the triggers. • A highly relaxed state, using a number of ancient Solfeggio backing tracks, used over centuries to release, repair and rejuvenate. • A safe guided journey back to the past to experience events through new and greater understanding. • A journey to the future to build an effective strategy for emotional control and stability. Others in the Overcome Anxiety range: Crowds And Gatherings, Public Transport, Planes And Air Travel, Stores And Multiplex Centres, Public Speaking And Presentations, Interviews And One To Ones, Eating And Drinking In Public, Public Restrooms And Toilets, Domestic And Wild Animals, Driving And Motorways and New Relationships. 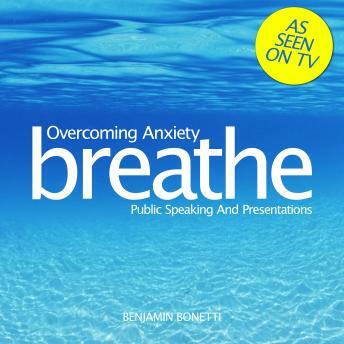 Note: The Overcoming Anxiety Meditations from Benjamin Bonetti are not suitable for under 18s. Do not use if you suffer from epilepsy, clinical depression or any other nervous or psychiatric conditions, or whilst driving, exercising, operating machinery or taking alcohol or drugs. If in doubt, seek medical advice.